Two years ahead of schedule, Harmon Lake - or Square Butte Dam No. 6 - had its official opening Thursday with a few snips of a ceremonial ribbon. Sen. Kent Conrad, D-N.D., and Gov. John Hoeven were among a slew of dignitaries on hand to comment on the dam, which doubles as a recreation area and flood-control project. Harmon Lake has been a work in progress since 1969, when area water resource boards realized the need for flood control for the nearly 40-square-mile watershed area of Square Butte Creek. Ground was broken for the dam six years ago and it was anticipated it would take three years to fill the 144-acre lake through natural runoff. But with near-record snowfall last winter, the lake filled in May. And with the subsequent flooding along the Heart and Missouri rivers, J.R. Flores, state conservationist for the Natural Resource Conservation Service, said damage from spring flooding would have been much greater. Flores told those gathered at the ribbon-cutting that about 60 homes downstream that otherwise would have flooded were saved at an estimated savings of $500,000 in flood damage. 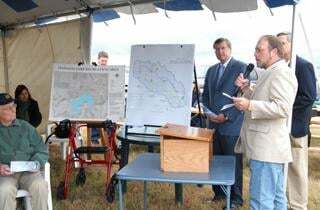 "Even though it took a while to get Harmon Lake dam built, it did not take long to reap some of its benefits," Flores said. Those at Thursday's event credited the foresight of some of the old-timers who served on various boards when the project was still on the drawing board. Andy Mork was one of those men. The longtime water board member, who has been a lifelong advocate of North Dakota water issues, was presented with a plaque as the first-ever recipient of the "River Man" award. Some joked that if you want to build a dam, you had better start the process as a young man. Today, the area located just off Highway 1806 and Morton County Road 140 includes a boat ramp and dock, and the hopes are to add more amenities to develop it as a camping area. Flores said, to date, $8.5 million has been spent on the project, with $6.5 million of that in federal funding. Flores said the NRCS paid for 100 percent of the costs of the flood control elements of the project and 50 percent of the recreation costs. The area is now managed by the Morton County Park Board under a one-year agreement that expires in 2010. Vern Davis, county park director, said other plans in the works for recreation improvements include the completion of an eight-mile trail system with a bridge, bath houses, a playground, water and electricity dug in the campground and construction of a maintenance shed. Davis estimated the total costs of the recreational improvements to be about $3 million. The state Game and Fish Department has stocked brown trout, rainbow trout and blue gills in the lake, which reaches a maximum depth of about 38 feet. For boaters and anglers, there is no maximum horsepower rating, but boats will be restricted to idle speed only.